Re: AZ: Canary in the coalmine for microinverters, too? TonyWilliams wrote: Ok, I can not find my inverter temps. Where should I look? You cannot get the temperatures from the public site, so you need to log in to your private site at https://enlighten.enphase.com . Once you are logged in, click the "Graph" tab and then near the top left click one of the Power graphs (Today, Last 7 Days or Custom). I used the Custom range so that I could hunt down the hottest day. Once you have a power graph up, you can turn on or off any of: Power Produced, DC Voltage, DC Current, AC Voltage, AC Frequency or Temperature. Unfortunately, as noted, you cannot get a Y-axis scale for anything except Power Produced. But you can hover over the curves to get the values from them. Anyway, it's not obvious how to get the data, but it is there. Please let us know what you see. Opps! I forgot one step! You cannot see anything other than Power Produced for the Full System. Click where it says that and pull down to '35 Microinverters'. Then select one from the list. It will put you back into the View tab to show you which one you selected. You can select from here instead, if you like. Then select the Graph tab again and you should see the other options at the bottom of the graph. I have updated the MTBF spreadsheet to include all failures observed until today. More M190 (and M380, which is a duplex M190) failures are observed, mainly on systems that already had multiple failures. One M380 system went from FOUR total failures (two pairs) to FOURTEEN total failures (seven pairs) out of fifty total inverters since last checked in April. We have had a LOT of thunderstorms this year, some quite severe. I'm really starting to think the high failure rates may be due to lightning. I read this thread with interest as I have a solar array with 16 enphase microinverters in Troy, Illinois. I installed the array in May/June 2011. As of June 2013, I have had 5 microinverters fail. I believe I have the M190 inverters. It does not appear that this site was used in the above-reference study of inverter failures. All of the inverters failed at various times in the months since after last year's record heat wave, when my thermometer indicated an ambient air temperature of about 110 degrees was reached on several days. Naturally, the roof temperature is going to be significantly higher. I have ordered some thermistors, and plan to get an IR heat sensor gun to try to measure the temperature on the roof. I have been questioning whether I got a bad batch or whether it is entirely a temperature stress problem. Unfortunately, I have not kept rigorous records of when these models failed with respect to temperature, and previously had no way to measure the roof temperature. If I had to do it all over again, and considering that global warming ain't gonna let up, I would probably use a main inverter at ground level. I'm really getting tired of climbing on the roof. Tinkeringcaveman wrote: I read this thread with interest as I have a solar array with 16 enphase microinverters in Troy, Illinois. I installed the array in May/June 2011. As of June 2013, I have had 5 microinverters fail. I believe I have the M190 inverters. Sorry about the failures. IMO it appears that certain batches seem more likely to fail than others. Many people will have no issues at all, while others will have significantly failures (like you). 5 / 16 is a horrendous failure rate and way above average. Looks like 3 inverters are still down? It also looks like you have another issue with the panel/inverter 3rd from the top-right - it's consistently under-producing the rest of the panels. Hopefully just dirt but could be a panel or inverter issue as well. Depending on the failure rate, it'd be interesting to figure out when it's "worth" going up on the roof to swap out failed parts since the rest of the array is still working fine. For most cases it's probably not worth going up for a single failure. Perhaps annual or bi-annual trips up to the roof to address issues? 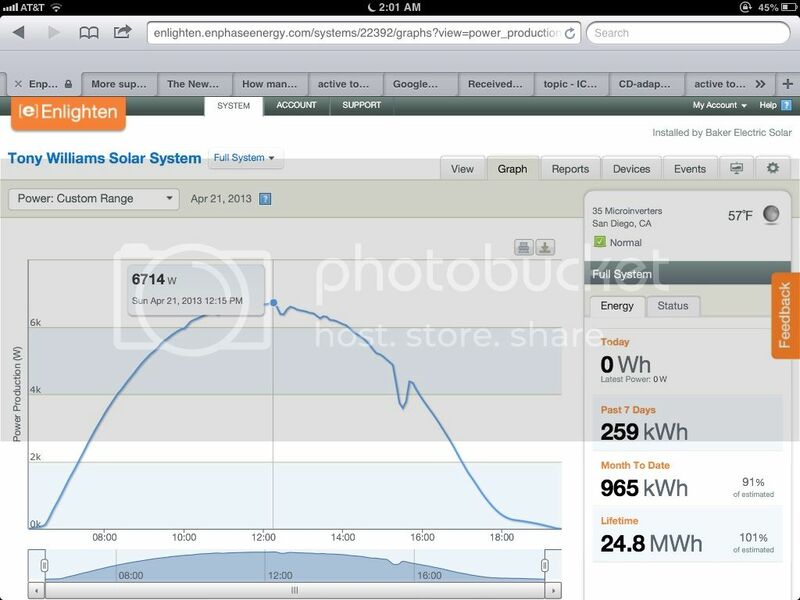 A single panel/inverter is only going to produce about 350 kWh / year at most unless you live in the desert. Yesterday, I did some spot checks into the inverter-reported temperatures for last summer. I looked at one of the failed modules, and one that has been operating without any problems. I would like to spend more time this week compiling data. In both cases I examined, microinverter temperatures climbed about 150 degrees on a small number of occasions during the hottest weather. On one day, the failed inverter registered 158 degrees, while the ambient reported air temperature for the local weather station was 108 degrees. The M190s are rated for up to 65 degrees Centrigrade--149 degrees Fahrenheit. My preliminary review of just those two modules identified seven days in 2012 when the inverter temperatures met or exceeded the design temperature. The modules are mounted in the manner specified by the enphase literature, and the same way I see them mounted on arrays in numerous ads, magazines, and web sites. I have more work to do, but still preliminarily believe heat is the cuplrit. I have a brown roof, which probably does not help the situation. I suspect a ground array or post-mounted array would not experience these temperature problems, and would have no qualms about using microinverters there. I am increasingly hesitant to recommend to anyone that they use them on rooftops. BTW - the lower performing module you mentioned is a damaged PV module- the glass has been shattered, but it has steadily produced 80% or so of its rated output since I shattered it during installation. Tinkeringcaveman wrote: BTW - the lower performing module you mentioned is a damaged PV module- the glass has been shattered, but it has steadily produced 80% or so of its rated output since I shattered it during installation. No fun, how'd you shatter it? Pretty neat that even after this long it's till putting out 80% though. Tinkeringcaveman wrote: I suspect a ground array or post-mounted array would not experience these temperature problems, and would have no qualms about using microinverters there. I am increasingly hesitant to recommend to anyone that they use them on rooftops. I think it's important to remember that each generation they've improved the design. If we are to assume that the warranty is at least a little bit based on the life of the product I don't think it's fair to rule out microinverters because of your experience with the M190. The next generation of microinverter, the M215 would appear to address these concerns. Warranty from 15 years to 25. Warranty now covers the labor to uninstall and reinstall the M215 and additionally covers lost production. The operating temperature was increased to 85 degrees C and the ambient temperature is 65 degrees C. Remember that the M190 is technology that was released to the market 4 years ago. Even the M215 is now 2 years old. The next generation is coming out very shortly. Tinkeringcaveman wrote: I have more work to do, but still preliminarily believe heat is the cuplrit. 4 separate arrays which have been expanded twice over the years. He has the 7 of the original M175 inverters - the rest are M190s. Only one failure so far after a number of years in the Tuscon heat - and that was one of the original M175 inverters. Tinkeringcaveman wrote: I have a brown roof, which probably does not help the situation. Probably not. In my discussion with others a big issue is heat being radiated back through the attic onto the back of the panels. Your attic is probably in the 150F range - similar to the inverter temps. So anything you can do to help cool the attic will also help reduce inverter temps. Properly installed radiant barrier will help keep the heat out of the attic and installed under the panels will help keep the heat from going the other direction and heating up the inverters/panels. Ground mounted systems will definitely have lower temperatures. But mounting the panels higher off the roof with some spacing between rows will also be effective. 6" off the roof instead of as close as possible as many try to get the panels will reduce temperatures boosting production as well as improving lifetime of the inverters. QueenBee wrote: The next generation is coming out very shortly. 3. Isolated DC circuit - GEC grounding no longer required for inverter. Hear's an early release of the new grounding guidance. QueenBee wrote: Hear's an early release of the new grounding guidance.